Rosé wines, traditionally dry and light, appeal both to white and red wine drinkers seeking something cool and refreshing to help beat the heat. Rosé wines, traditionally dry and light, appeal both to white and red wine drinkers seeking something cool and refreshing to help beat the heat. Enjoy GAYOT.com's favorites. Vinho Verde is not just a style of wine (young and fresh), but a wine region that produces rosés as well as whites. Composed of 90 percent Vinhão and 10 percent Rabo-de-Anho, this brightly-colored wine also boasts bright strawberry flavors. Light in the mouth, it finishes a tad sweet. Try it with fresh fish, crisp salads or cold pasta dishes. 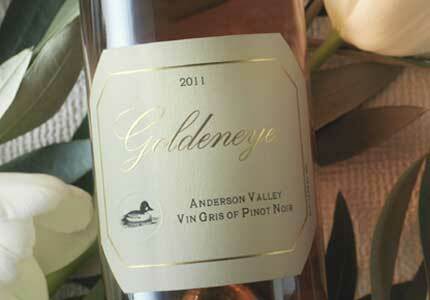 A Duckhorn Wine Company brand, Goldeneye specializes in Pinot Noir produced at their estate winery in Mendocino County's Anderson Valley. Their Vin Gris of Pinot Noir showcases the lighter side of the famously delicate Burgundian varietal. On the nose, it displays fragrant aromas of ruby red grapefruit, strawberry and watermelon. In the mouth, the wine is crisp and acidic, yet balanced by a slight sweetness. This is rosé made in a truly classic style with rose-pink color, medium body, fruity flavors yet a dry finish. It is simple, food-friendly and exactly what you would hope for from a modestly-priced rosé. The wine works very well with picnic foods like cold, fried chicken, potato salad and pound cake but it should work fairly well with any summer food you're craving. A vibrant, ruby pink, this wine's color echoes its content. Complex, robust yet surprisingly elegant, this very sophisticated rosé offers restrained strawberry, tart cherry, pomegranate and honeysuckle aromas and flavors with citrus acidity and a note of bone dry, mouthwatering minerality on the finish. Serve this absolute classic with traditional southern French foods like ratatouille, fresh goats' milk cheeses, steamed mussels or simply a dish of Niçoise olives. We think this is one of the summer's best buy wines. It packs intense flavor and complexity for its $10 price tag, with rose petal and strawberry candy aromas, tart berry and stone fruit flavor with a hint of minerality on the lingering finish. An extremely food-friendly wine, dry yet robustly fruity, it will work with a variety of foods. Serve it with anything from spice-rubbed, grilled chicken, pork or even lamb to tuna Niçoise or a grilled vegetable platter. This well-priced bubbly is a pretty shade of pale salmon with a fine mousse and light, floral aromas. Citrus and strawberry are dominant flavors with a rich sweetness that sits pleasantly on the mid-palate. The wine lingers relatively long with a slight caramel, nutty note. Serve with classic brunch fare, a picnic of cold, herb-rubbed pork and fruit salad or on its own to toast the sunset at the end of a long day. A specialist in Bordeaux-style red wines, otherwise known as Meritage, Blackbird Vineyards blends its 2012 Arriviste Rosé from 38 percent Merlot, 36 percent Cabernet Sauvignon and 26 percent Cabernet Franc. It is produced using the saignée method and sourced from some of Napa Valley's most renowned vineyards. In the mouth, the wine reveals tangy citrus and cherry flavors with mineral notes, a vigorous acidity and a clean finish. Try it with spicy Asian noodles or a vegetable stir fry. A boutique, eco-friendly winery in Sonoma Valley, Lasseter includes 95 acres of organically-farmed vineyards. Their 2010 Enjoué (French for "joyful") is composed of 64 percent Syrah, 31 percent Mourvèdre and 5 percent Grenache. On the nose, it offers a fragrant bouquet of fresh strawberry, ruby red grapefruit and mango. In the mouth, this well-structured and refreshing rosé reveals a racy acidity and enduring finish. Named for a Robin Hood-like figure who lived in the region two centuries ago, the Scalabrone is composed of 40 percent Cabernet Sauvignon, 30 percent Merlot and 30 percent Syrah. A refreshingly dry rosé, it boasts luscious cherry flavors with fragrant herbal notes. Serve with light salads, charcuterie or a crispy panini. While rosés can be made from any red wine varietals, it is difficult to produce a good one from Cabernet Sauvignon due to the grape's heavier tannins. This 2011 Rosé of Cabernet Sauvignon gets it just right, with an aromatic nose, delicate texture and flavors of strawberry, pomegranate and red currants. Pair it with dishes like smoked salmon, pasta carbonara and Waldorf salad.